Yesterday (#BePeaceSunday), we had a lengthy Twitter discussion with Carl Weathers, Randy Falk of NECA Toys, and fans of NECA and Predator. To follow that up, I asked him to clarify. 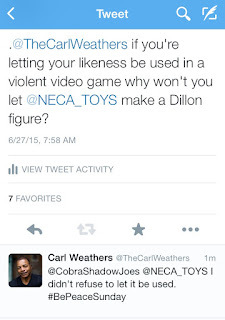 I asked him if he would allow NECA to make a Dillon figure. This led to many back and forth tweets on the subject. 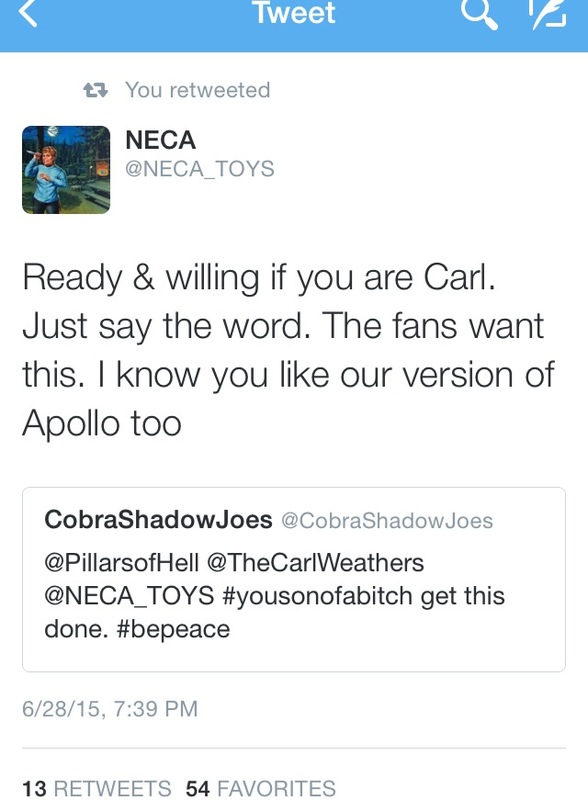 Randy Falk, from NECA Toys, entered the conversation and called Mr. Weathers out and said he is ready any time to get this done. He knows that his fans want this very bad. 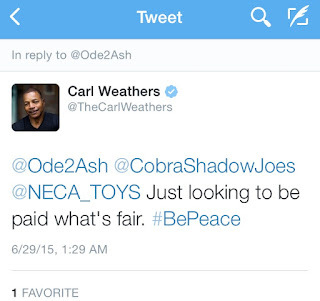 This led to the bottom line: It is my opinion that Carl Weathers wants to get PAID!!! And not just paid, but paid big time! Fair? What's fair? 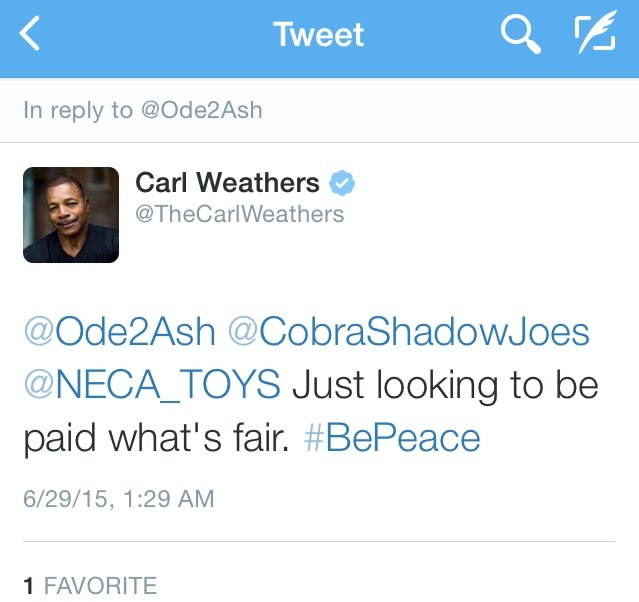 Why is it that big time stars such as Arnold Schwarzenegger, Sylvester Stallone, and Sigourney Weaver can get deals done with NECA but Carl Weathers can't? Let's be blunt here. 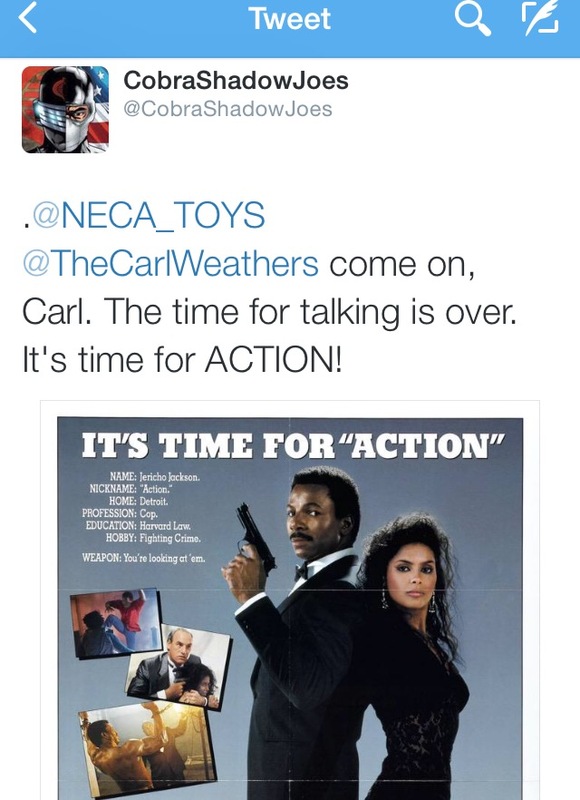 Carl Weather is not known as the leading man in any of his movies....except ACTION JACKSON which is basically a cult classic. 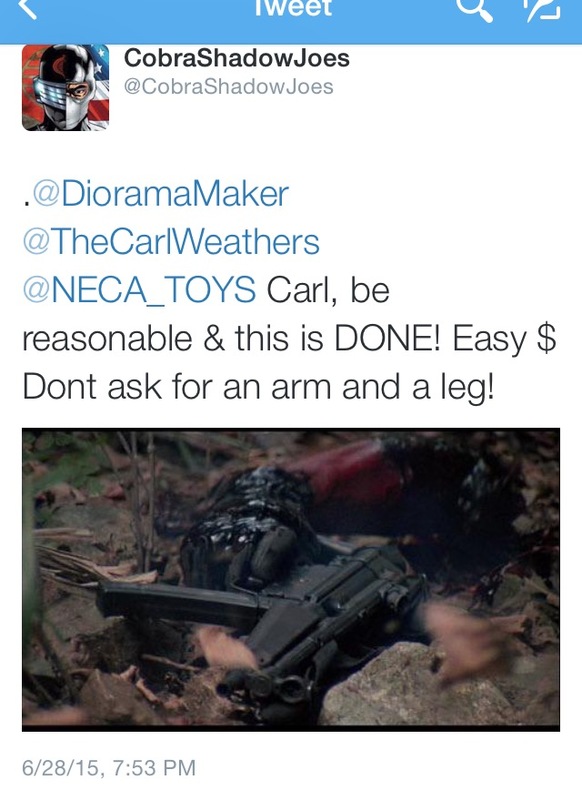 In my opinion, this is easy money that takes no effort on the part of Carl Weathers. All he has to do is agree and and collect money from a movie he was in (not even the star, btw) thirty years ago! I am assuming he is looking for an insanely large amount of money. This seems silly. 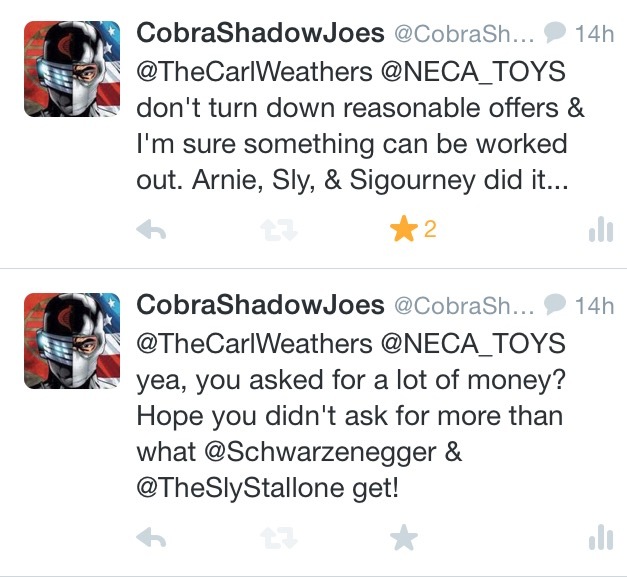 Like I said earlier, others stars have been able to get deals done with NECA, and it is obvious Randy and NECA want to see this done just as much as the fans do. So instead of accepting the offer and making easy money he will instead get NOTHING and disappoint many fans in the process! One thing to realize is that Carl Weathers has a history of doing this kind of thing. Next time you watch Rocky Balboa look and see if you notice anything missing from the movie. There is a brief montage clip played in the movie. Flashbacks of Ivan Drago and Clubber Lang...but NO APOLLO CREED!!! Why? I'll let Sylvester Stallone answer that question. ""Apollo Creed is not in ROCKY BALBOA because he wanted many thousands of dollars for a two-second piece of he and Rocky boxing," said Stallone. "Unfortunately we couldn’t afford it. Then again, what ever happened to loyalty? Apollo Greed?" 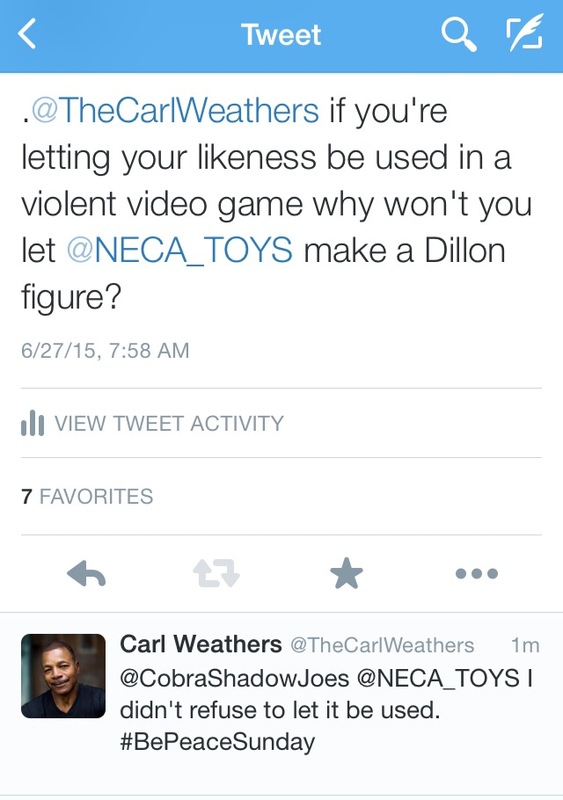 So will we ever see a Dillon Predator figure in the future? Obviously, this is something that Randy Falk and the NECA team and all of the fans want to see extremely bad. 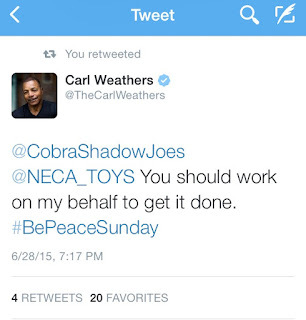 Carl Weathers sees that the fans want to see this done. I say don't turn down reasonable offers and let's get this done. Something tells me that if Mr. Weathers really wanted to do this that it would have already happened by now...but at least we can always hope. And remember, a little pressure from fans on social media can't hurt.